It is fascinating to read about the flowering of a simple, experimental idea and the beneficial, sometimes miraculous, changes wrought by the subsequent classes. Awarded a Churchill Fellowship in 1996, Nancy was able to travel to Europe and North America to expand her understanding of the therapeutic benefits of art for people with Parkinson’s. A synergy came about, where Nancy discovered new techniques and ideas in this area and the people overseas were in turn influenced by her ideas. 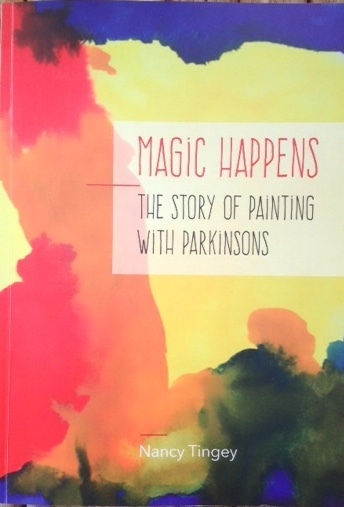 Ultimately, Painting with Parkinsons developed into an internationally recognised role model. In Magic Happens we learn that the condition of Parkinson’s begins with a diminishing of dopamine, the neurotransmitter that is vital for the smooth functioning of the central nervous system. The cause is not yet understood. Medication can supply dopamine, which calms down the nervous system so that neural impulses flow freely again. And as the author discovered, creative activity has a similar effect, as does meditation. People in Nancy’s Painting with Parkinsons groups found that they breathed more easily when painting. One person said that she had ‘a lovely flowing feeling’ at the end of her fingertips while she painted. Another loved ‘the joy of starting something that I can complete without having to ask for help.’ (p. 77) Some comment on the humour and levity in the classes, which teacher John Pratt believes comes from a great feeling of trust. ‘When I am sketching I forget about Parkinson’s and it forgets about me,’ said participant Charles Armstrong. Nancy met some Parkinson’s groups in England and elsewhere who were doing yoga, tai chi and meditation. She saw participants’ symptoms diminish or even disappear during an hour-long yoga session. This effect was usually temporary but it gave welcome respite and proved a wonderful thing for people to be able to anticipate each week. One person in Margate had been doing yoga every day for five years. Her doctor said that he could find no increase in her symptoms over that time. In Toronto a tai chi teacher reported similar results. When Nancy returned from her Churchill Fellowship she remodelled her classes to enrich them with the latest overseas breakthroughs and techniques. Her program became so successful that it influenced the establishment of other Parkinson’s groups in Australia and overseas.